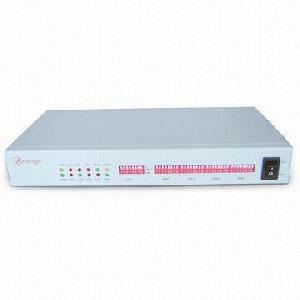 FBPC100 Series protocol converter is a high performance, remote, self-learning Ethernet Bridge. Its compact size and low cost make it ideal for cost-sensitive bridging applications or as a LAN extender over bit stream type infrastructures. The main E1 link may be clocked from the recovered receive clock or from an internal oscillator. This converter allows transmitting and receiving VLAN data packets. Standalone and Rack mount module are both available. Support loop test, CRC selection, local/remote indicators etc. View and configure the E1 and Ethernet ports status, such as E1 loop back, Ethernet ports rate limitation, and etc.